Growing up in the suburbs of New York, I had a huge yard with plenty of space to roam and explore. I remember playing outdoors for hours as a child, unearthing rocks and breaking them open hoping to find gems. I would dig through the dirt, pretending to be an archaeologist looking for lost cities and treasures. We had a garden where I would help my mother harvest lettuce, cucumbers, eggplants and tomatoes. Fortunately I didn’t have to leave my property to experience the beauty and wonder of nature. These experiences left a lasting impression, and began my love and fascination with the natural world. As an adult, I moved from New York to Florida, met my husband and had a child. Early on I could tell my son also had a love of the outdoors. When he was a baby I would bring him out to the grass behind our home with blocks, bubbles and books. I would read, sing and play with him. There was something about being outside in the sunshine that made us both relaxed and happy. He loved to crawl through the grass and would always smile when a breeze picked up and touched his face. I would carry him around and point out all the different trees, bushes and flowers. We would listen to the birds and walk in the grass. We would sit for hours, and just take it all in. 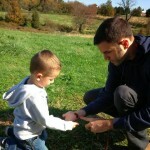 I truly believe these experiences were helping my son become aware of the natural world around us. This was confirmed while playing indoors: he heard a bird-call from outside and suddenly stopped playing and began pointing to the ceiling. He was excited and wanted to investigate. I took him out on the patio to find the sound, and he happily sat watching the bird singing in the palm tree. Although he was unable to talk, I could see the curiosity that nature was inspiring in his life, and his desire to learn more. It wasn’t until we moved into a yard-less apartment in Old City, Philadelphia, that I realized how important those experiences in nature had been. We needed to find a balance between city life and nature, quick! I wanted to get my family back to where we could get lost in nature, explore independently, and not be distracted by the hustle and bustle of the city. I realized that I would have to make a conscious effort to “find nature” if I wanted to nurture and build on my son’s love of the natural word. It was because of this that I began to seek out different natural areas in Philadelphia. I was amazed at how many beautiful and educational places there are in our city, including arboretums, gardens and education centers. Even more amazing, was how few people were aware of these places! Recently, I was made aware of the Children & Nature Network. It’s a fantastic organization that has started a grassroots campaign to get more children outdoors. Their site does a great job of posting articles and research to help families understand the critical connection between time spent in nature and a child’s developing brain. I was truly inspired by this research and movement because of my family’s own experiences in nature. So, the good news is you don’t have to move to the suburbs to get outdoors and explore! Finding Nature-Philadelphia is a newly formed, nature-based, meet-up group in Philadelphia! Nature groups, meet-ups and clubs are a great way for people to get outdoors together and immerse themselves in nature! Although this group will mainly focus on children and their families, anyone is welcome to attend! The group will meet once a month for a FREE & FUN event at various locations in and around Philadelphia! I am happy to announce that our first meet-up is going to take place on Saturday, April 5, 2014 at the Schuylkill Center for Environmental Education! My family and I love SCEE! My son attends Nature Preschool at the Schuylkill Center and it is the perfect place for families to see the natural beauty in their own backyard. I hope you will come out and join us for a fun, FREE, outdoor adventure! This entry was posted in Education, Events and tagged nature, the schuylkill center. Bookmark the permalink. What a wonderful idea! I won’t be able to make the first session but am eager to stay abreast of your outings and ideas! Thanks! I really enjoyed reading that. You’ve touched my heart!